(a) When troubleshooting OBD II (On-Board Diagnostics) vehicles, an OBD II scan tool (complying with SAE J1978) must be connected to the DLC3 (Data Link Connector 3) of the vehicle. Various data in the vehicle ECM (Engine Control Module) can be then read. (1) The emission control system components. (2) The powertrain control components (which affect vehicle emissions). In addition, the applicable DTCs prescribed by SAE J2012 are recorded in the ECM memory. If the malfunction does not recur in 3 consecutive trips, the MIL turns off automatically but the DTCs remain recorded in the ECM memory. (c) To check for DTCs, connect the Techstream to the DLC3. The Techstream displays DTCs, freeze frame data, and a variety of the engine data. 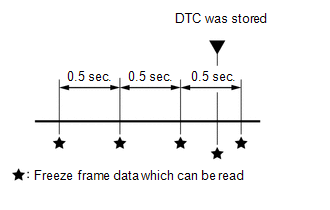 The DTCs and freeze frame data can be cleared with the Techstream. In order to enhance OBD function on vehicles and develop the off-board diagnosis system, Controller Area Network (CAN) communication is used in this system. CAN is a network which uses a pair of data transmission lines spanning multiple computers and sensors. It allows for high speed communications between the systems and simplification of the wire harness connections (See page ). (a) The diagnosis system operates in normal mode during normal vehicle use. In normal mode, 2 trip detection logic is used to ensure accurate detection of malfunctions. Check mode is also available as an option for technicians. In check mode, 1 trip detection logic is used for duplicating malfunction symptoms and increasing the system's ability to detect malfunctions, including intermittent problems (the Techstream only). (a) When a malfunction is first detected, the malfunction is temporarily stored in the ECM memory (1st trip). If the same malfunction is detected during the subsequent driving cycle, the MIL is illuminated (2nd trip). (a) The ECM records vehicle and driving condition information as freeze frame data the moment a DTC is stored. When troubleshooting, freeze frame data can be helpful in determining whether the vehicle was running or stopped, whether the engine was warmed up or not, whether the air fuel ratio was lean or rich, as well as other data recorded at the time of a malfunction. (b) The Techstream records freeze frame data in 5 different instances: 1) 3 times before the DTC is stored, 2) once when the DTC is stored, and 3) once after the DTC is stored. These sets of data can be used to simulate the vehicle condition around the time when the malfunction occurred. The data may help in finding the cause of the malfunction, or in judging if the DTC was caused by a temporary malfunction. 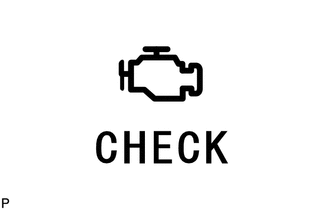 (a) The MIL illuminates when the turning the ignition switch to ON (the engine is not running). (b) The MIL should turn off when the engine is started. If the MIL remains illuminated, the diagnosis system has detected a malfunction or abnormality in the system. If the MIL does not illuminate when the turning the ignition switch to ON, check the MIL circuit (See page ).